Genuine cow bell sound - all prettied up and ready to hang in your home. This bell has a great tone and looks great, too. Use it to call the family in to dinner, or hang it in a tree and let the breezes make it ring while it harmonizes with the wind. In Sanskrit, Dharma can mean many things including truth and protection. Buddhists study Dharma in order to achieve inner peace and happiness. For centuries, tuned bells have been suspended in homes and temples in the East to ward off evil and attract good luck and prosperity. 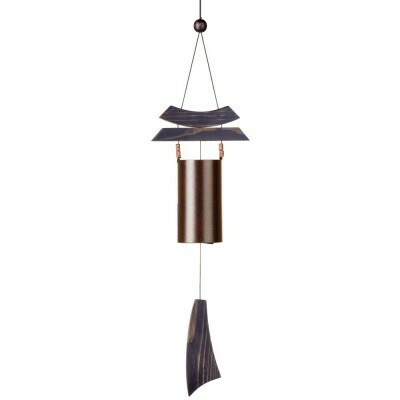 Measures 28" in overall length and is made of black wash finish pine wood and antique copper powder-coated steel beads.